more greeny, would've been a nice contrast between her dark solem colors. I love it! 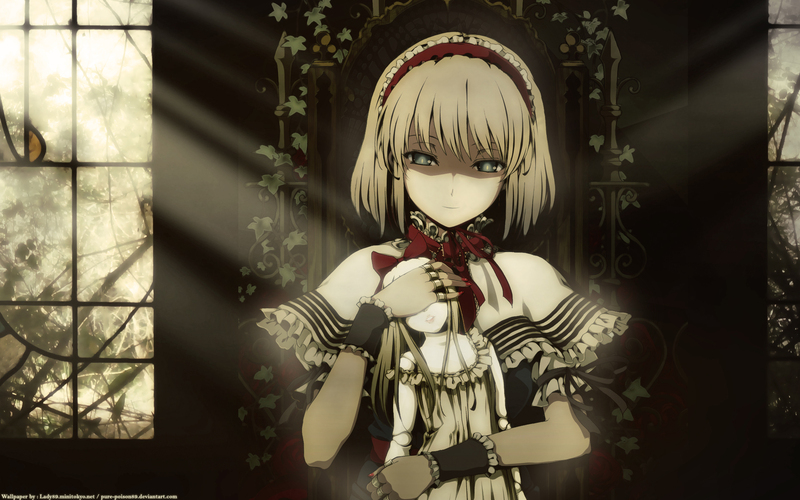 the light coming from the windows shining on the old doll, the lonely expression of the girl, and the background! it's all so mysterious and cool! I have always been very curious about your walling process, so it makes me a tad sad to see that you don't describe it that much, I'd like to know about the filters you used (or if you didn't) or the blending modes, or what makes you pick a certain scan...oh well, things like that. Anyways, everything fits very well, I like the ray of lights you added, but I think they're too...err...solid? maybe if they were softer they'd look even better. Amazing as usual, plus it reminds me of a Cabaret show I went to in Honolulu a few months ago called Alice in Chinatown. Afterwards we had a Mar-tea-ni party with the Mad Hatter, it was a wonderful evening. Anyway, Great choice of the scan, it fits nicely with the Bg, plus the colors are amazing, I love the sepia tons you used. The effects give such a soft touch! Wonderful! I love the light effect, it is awesome. Just amazing wallpaper! I like it so much! and add it as a fav! The image is haunting, the way her hand is covering the dolls eyes, as if there is something she wishes that she did not have to view herself. Beautiful and poignant, this work is enhanced by the effect of the play of light. The effects and the blending are very well done! Great job. I take it that you like making "sad" wallpapers? I like it, because sadness leaves a deeper impact than other thems/emotions.